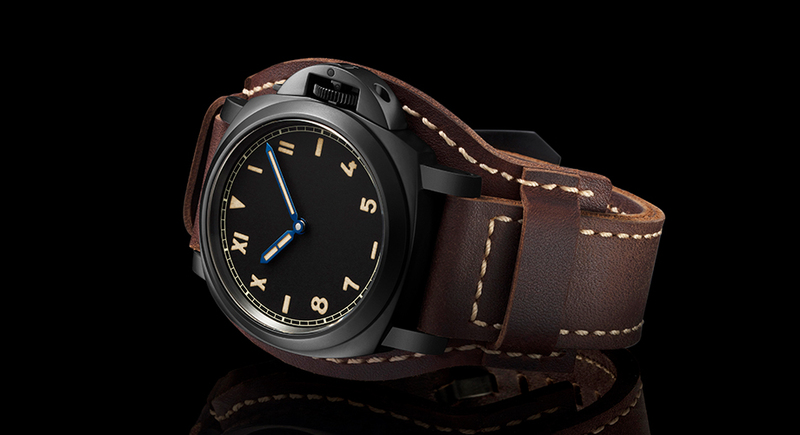 What do you get when you combine all the cool things about Italian watchmaker Panerai’s military past? 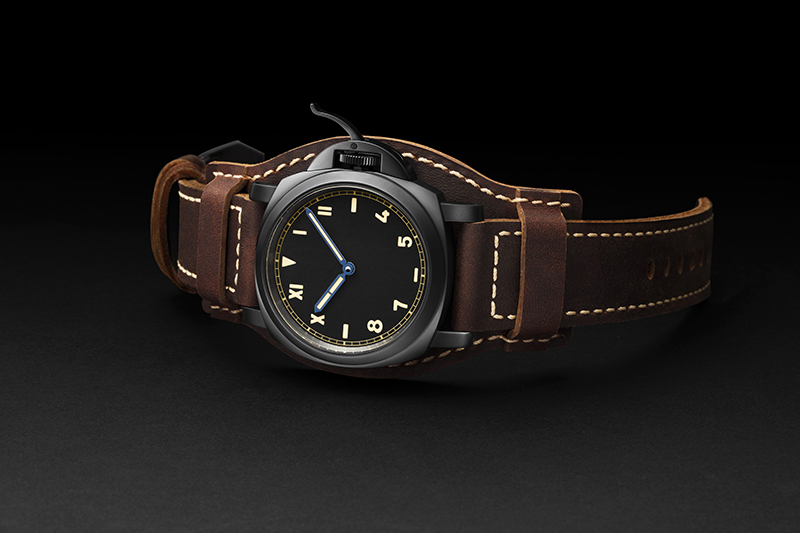 You get the Luminor California 8 Days DLC – 44mm, that’s what. 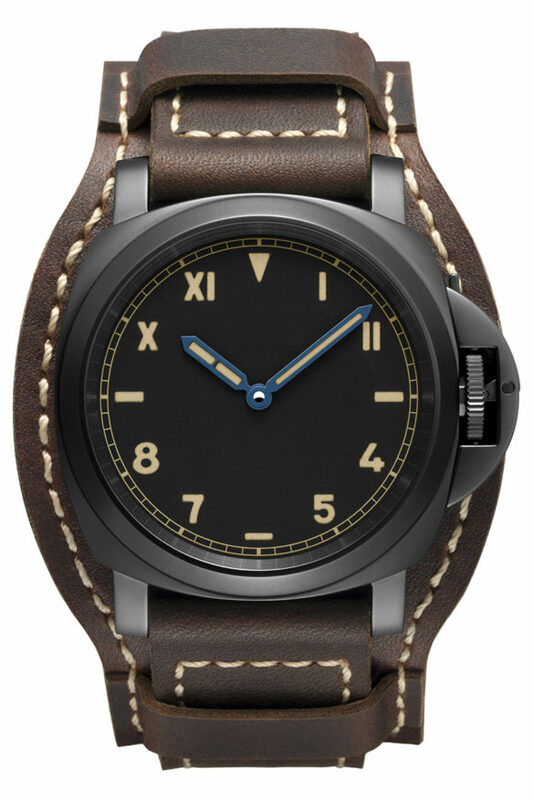 An exercise in military-grade “re-appropriation,” this version of the Luminor could have easily been a disaster, but, because of the Italian watchmaker’s careful dissemination of the brand’s historical design codes, it all works to create an outstandingly distinctive and militarized aesthetic. 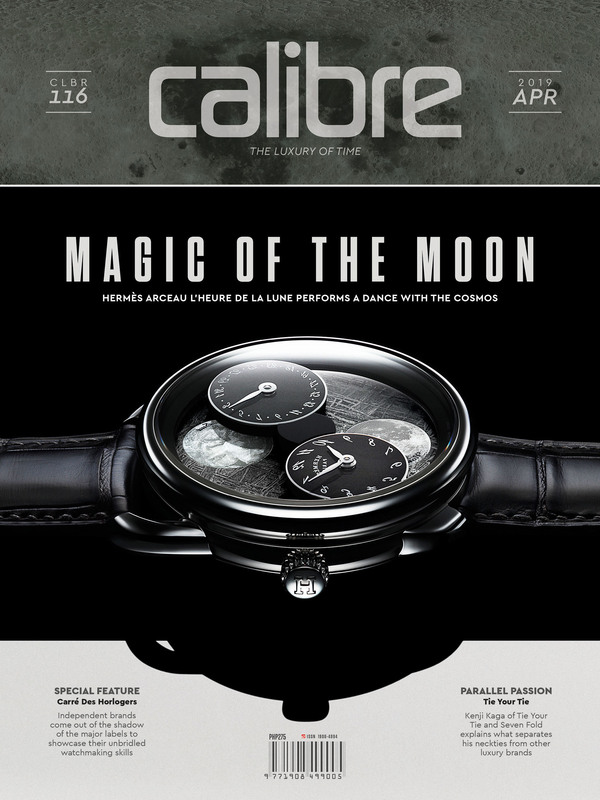 Yes, everything from the California dial, the titanium case coated in DLC, and even the bridge lever device, is something we’ve historically seen from Panerai before, but following the same “everything is new again” formula that the Italian watchmaker has become an expert at, have been re-distributed here in such a way that keeps the Luminor California 8 Days DLC especially fresh and exciting. And it all starts with that time-only dial: there isn’t a trace of branding on it to detract from its clean and militarized aesthetic. All we get, in fact, is a deep matte-black dial flourished with Arabic numerals at the bottom half, Roman numerals at the top half, and enhanced by baton hour markers that channel the iconic “California” dial designs originally used for the brand’s earliest military clients. 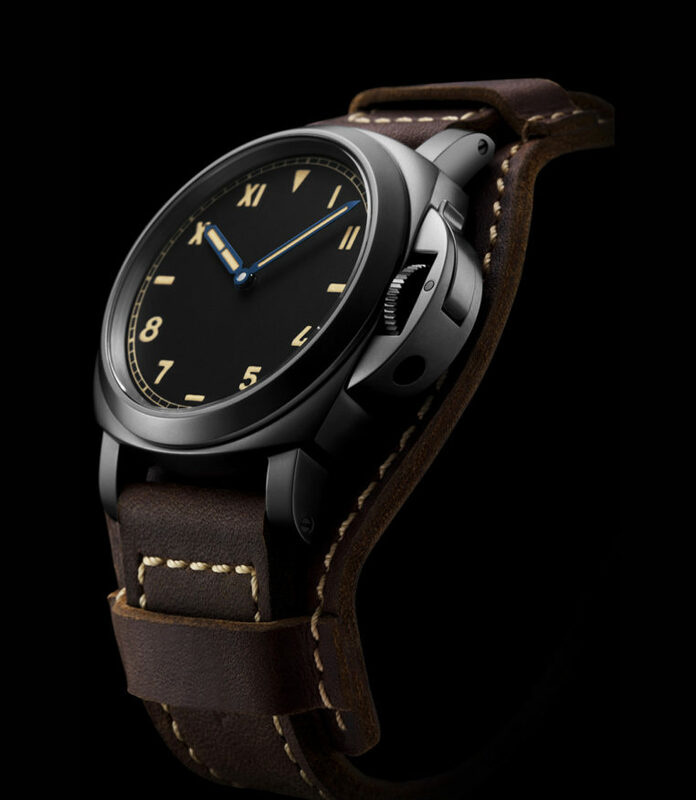 These are lumed in a tritium-colored SuperLuminova that enhances that vintage/military vibe, while the distinctive hour and minute hands have been oxidized at a controlled temperature of 290-300°C to give it that particular metallic blue, which, again, is reminiscent of many historic Panerai models. The California dial is enhanced by a lightweight-ish 44mm titanium case (which is the intermediate size of Panerai) turbocharged with the Luminor collection’s signature bridge lever device to protect the winding crown. These conspire to give the watch its whopping 300meter water resistance, and are enhanced by a coating of black Diamond Like Carbon (DLC). Aside from an unblemished, uniform appearance, this carbon-based layer, combined with a matte anthracite finish gives the vintage-inspired watch a thoroughly modern appeal, and results in an extremely hard case made more resistant to scratches and corrosion. Inside the Luminor California 8 Days DLC beats the hand-wound P.5000 calibre, a double mainspring movement that boasts a massive 8 days of power reserve completely developed and produced in the Panerai Manufacture in Neuchâtel. The P.5000 movement is (again) relevant to the brand’s military past, and, in fact, pays homage to actual Panerai watches equipped with large Angelus 8-day movements used by Italian frogmen in the 1940s. The movement is 15. lignes in diameter and 4.5 mm thick, very solidly constructed and fitted with a large brush-finished plate with diamond polished chamfering; this almost completely conceals the wheelwork, while revealing the balance which oscillates at a frequency of 21,600 vibrations per hour, or 3Hz. And since this is a military-inspired device, the movement isn’t visible and is concealed behind a plain stainless steel caseback. 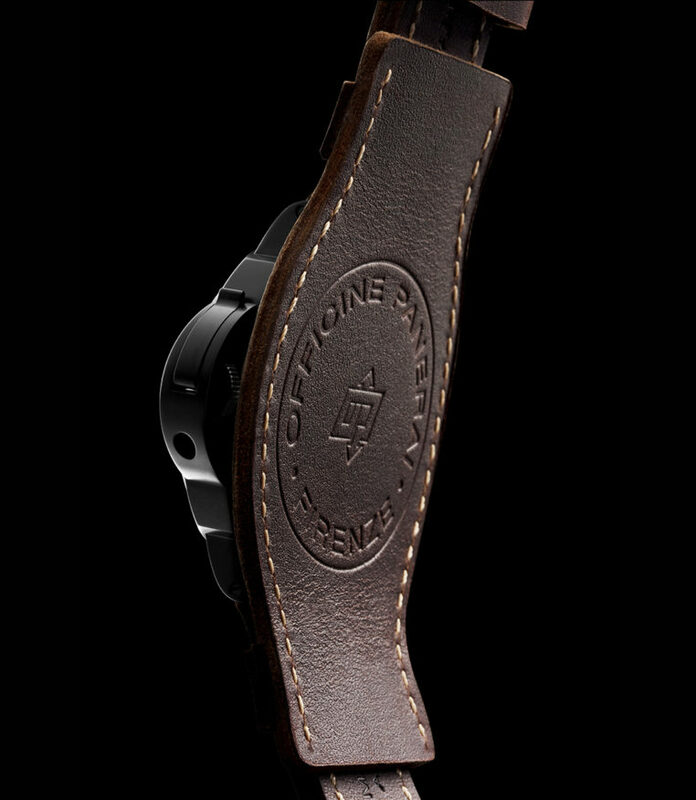 Tying all these elements together is a vintage-appropriate bund strap, which was (again) historically offered to the Italian military, and prevented the back of the watch from coming into contact with the serviceman’s skin. Made to great effect with untreated leather, the strap combines a softness (both to the touch and to the eye) that belies its great strength, and can be worn as is or removed in lieu of a traditional two-piece leather strap. 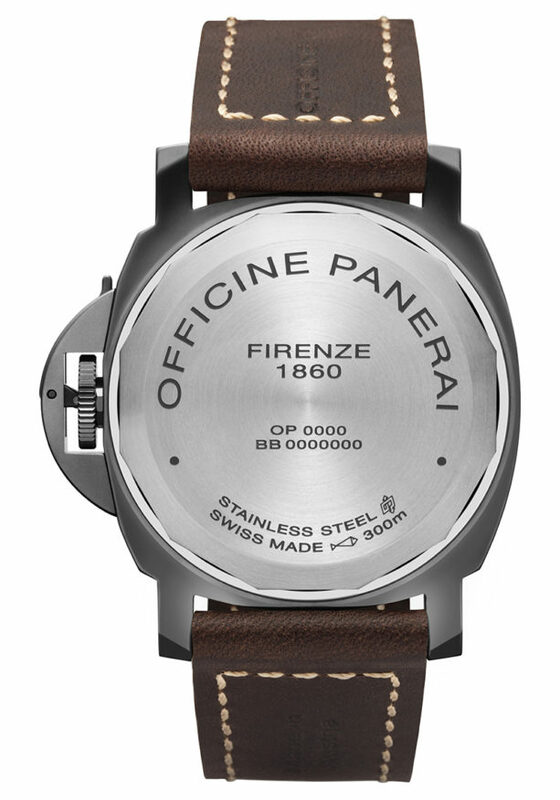 Best of all, both the passage of time and its continued use will create a patina that will vary from strap to strap. Both leather straps are personalized with contrasting beige stitching and heat stamped with the OP logo. These are fitted with a DLC-coated buckle, and for the more active wearer, the Luminor California 8 Days DLC can also be worn with an optional black rubber strap.